I can feel it. I can see it. It surrounds me, especially on those quiet days of work. My sorrel steps through the sagebrush and the wind caresses my cheek. I lift the reins and guide the horse downhill and a whispered “swisssss” sends my English Shepherd further downhill to gather some stray cattle. Black heads are bent, ripping grass, but they come alert when the dog appears and they hustle to catch up to the protection of the herd. I can look across the valley and see my three children, all horseback, each gathering the cows and calves and pushing them forward. My husband rides his bay ahead a half mile up the next hill, my father-in-law even farther up at the front of the bunch. 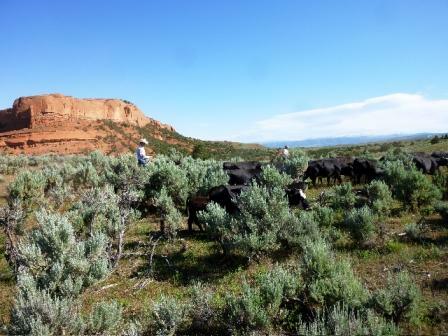 We’re a team intent on gathering this pasture. We each know our jobs, our partnership forged over years of practice. The kids are no longer kids, but adults who have done this practically every year of their 20 something lives. They sit their horses easily, a talent I wished for over and over in my younger days. I am content with my meager abilities and marvel at theirs. The brilliant blue Wyoming sky arches over us with large white clouds skudding along the jet stream. I stop and admire the scenery. I am the only one in this crowd not born and raised on this land, and I still remember the awe I felt when I was first married… that I could do this for a living, for the rest of my life! This simple chore of gathering cattle reflects all our blessings. 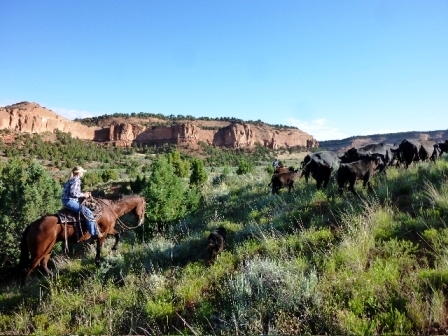 A Wyoming Centennial ranch… celebrating over one hundred years in the same family… is our home. Our multi-generational family works well together, the work ethic that ranching instills is definitely being passed along. We work with and in nature. We feel Mother Nature’s blessings and her crankiness, in springtime warmth and the blizzard’s piercing driven snow. In tall grass and drought. Mud and dust. Life and death. We are each creative in our own ways… some with machinery, others with welding, some with animals, some with farming. We balance each other, support each other, encourage each other. We are friends as well as family. We can be independent as well, working on our own schedule. We can go our different ways if necessary! I cluck to my horse and make him step out again. The cattle need more encouragement to leave the tall grass and my kids are bringing up their small groups to join in the main bunch. A whistle and a “swisss” and we’re moving along the trail. The stories and conversations can start… the teasing and haggling and laughing… We are blessed and I am thankful to be part of an agriculture family. Carol is a Wyoming Cattlewoman, dog lover, avid blogger. Enjoy Carol’s great stories of life on the ranch and working with her dogs in the Wyoming cattle country at her blog Red Dirt in My Soul. Be sure to stay tuned during the month of November to hear more great stories of why others are Ag-Thankful and check out the entire Ag-Thankful series. Beautiful post by Carol. Makes me homesick for Wyoming and ranch life. I read her blog every day. I at one time was a newly wed who lived at the same ranch. I admire Carol for all of her talents and hard work.